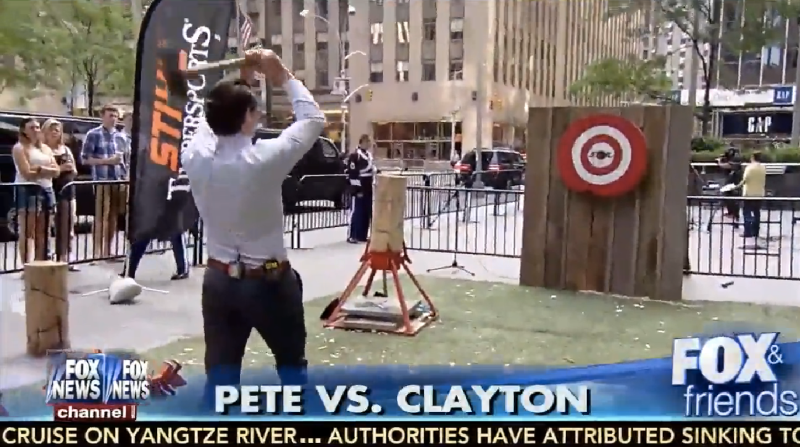 For some reason, co-anchor Pete Hegseth attempted to throw an ax at a target just before a commercial break. Several West Point drummers were lined up behind said target, drumming away to celebrate Flag Day. Pat, we were doing commercial bumps on Fox and Friends Sunday morning celebrating the Army’s 240th birthday and flag day. My leadership told me they were told there would be no axe throwing. I think the anchor person went rogue and decided to throw it. He had only thrown it once before in practice for an upcoming segment and they told him to throw it with more force. The vid you see is edited showing the Televised portion of the throw and then edited to a portion that was taken on someone’s phone of us being videoed. The part that was actually televised showed the overthrown axe and then segued to us for the drum solo bump, only showing me walking behind the section holding my arm. The actual part where the axe hit me was not televised. Poor decision, obvious negligence, should not have happened, could have been avoided. When shooting or throwing, always know what is behind your target. Basic safety rule. I’m feeling blessed on Father’s day with my 5 children, alive, and with all limbs.